An historic Roman city near Hama, Syria, is among the archaeological treasures threated by Syria’s continued civil war. In 300 B.C., Seleucus Nicator, one of Alexander the Great’s generals, who had conquered much of the Middle East, established a city along the Orontes River named Apamea in honor of his wife. Apamea became an important military center in the Seleucid Empire, home to 500 war elephants that Seleucus had obtained in a trade with an Indian emperor. In 64 B.C., Pompey captured Apamea and annexed it to the Roman Empire. The Romans then erected a 20,000 seat theater, one of the largest in the empire. Mark Anthony and Cleopatra visited Apamea during their honeymoon in 37 B.C., when the city had a population of about 100,000. During the Jewish Revolt that began in 66 A.D., Apamea sheltered its Jewish residents from Roman soldiers. 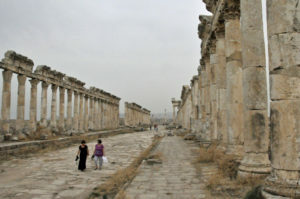 After an earthquake destroyed much of Apamea in 115 A.D., Roman Emperor Trajan reconstructed the Cardo Maximus, a 1.2-mile-long main street by 1200 30-foot-high columns and intersected every 360 feet by side streets. The 68-foot-wide street was among the largest and most famous streets in the Roman Empire, passing temples, shops and baths. Some of the stone columns had unique spiral fluting along their entire length. In the sixth century, Byzantine Emperor Justinian repaired Apamea’s Cardo Maximus, adding walkways and replacing paving stones. A few years later, the Persians destroyed the city and partially rebuilt it. Apamea was demolished by an earthquake in 1152. By 2010, about 400 columns along Apamea’s Cardo Maximus had been reconstructed, along with a few decorative arches marking the intersections. Some of the businesses lining the street, including a brothel, could be identified by stone signs. Recent satellite images show that Apamea has been the victim of extensive and destructive wartime looting.